The Kastro/Primavera is made up of two sets of apartments next to each other and they have got it sorted. Blissed out days round the pool, delicious drinks and snacks from the bar, which is open till late and a really nice atmosphere too. I have been to Malia for the last 5 years and stayed in these apartments every year (both the Kastro and the Primavera side). And having visited others and spoken to holiday makers in other hotels i would saw without a doubt they are one of the best in the whole of Malia. Ok so the rooms aren't 5* but if you're holidaying in a party destination like Malia I can't imagine why you think they would be? I have always found them clean and tidy with decent basic furniture and cooking utensils etc. The maid has always come in a few times a week and changed bedding and towels and cleaned up. The bathrooms are small but perfectly functional. Have eaten in both Charlies and Oscars a few times and always found the food to be reasonably priced and tasty. The staff are absolutely amazing. Maria doesn't appear to ever sleep but is fantastic and so very helpful and has on more than one occasion been known to make us all pot noodles at 5am when returning home hungry. And Nikos is the biggest ledgend ever! Best drinks and fun and games to be had to start and end your night with. The security guard make look scary but is an absolute doll, you'll only have problems with him if you are behaving like a d**k which unfortunately some brits abroad seem to do. The hotel is perfectly located at the start of the strip so the perfect place to be. Also means it's a little quieter when you eventually fall in to bed to sleep. Also is practically on the beach for your lazy days, though the pool area is lovely too though it can get busy cos it's not that big. Have never heard of anything being stolen in the hotel or dealt with rude staff or had my passport taken off me so not sure where the other reports are coming from. Only problem I've ever experienced there is from rude and annoying brits, like the people that come into the bar, demand free shots and then head up the strip without even buying a drink. How about a little politeness and respect for your hosts, believe me they can only make your holiday better. 2wentys have always been a good laugh over the years, had some amazing reps and some fairly rubbish ones. Same with the trips, some are amazing and unmissable and some are rubbish but think before you part with your money as they are getting more and more expensive every year. All in all would recommend this hotel a million times over and can't wait to go back already! 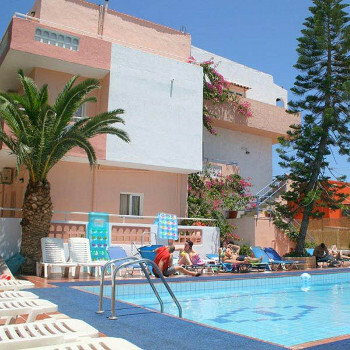 i went to this hotel and by far thought it was the best in malia for a clubbing holiday! the people who run it are amazing and such good fun they really look after you and treat you like family. the secruty were cool guys as well and only ask you to be reasonably quiet when you get in. The food was great as well and defo have the BBQ on friday amazing!! loved it want to work there next year as a P.R in this hotel such a wicked location right on the beach and just far enough from the big clubs to be able to get some shut eye if you evewr get home before morning haha brillent love it!!! the bar staff will keep you entertained with drinking games all night!! however, we walked in out room to find a VERY basic 3 bed room. the floor was dirty the walls were mingin and at smelt horrible. the chairs in our room were falling apart, our cutlery was basic old and our electric hob was covered in burnt black stuff. we didnt even have a toaster! we had no space to put any of our stuff so our room was always messy. We decided to go Self Catering. There was a mini kitchen in the corner of the room which consisted of 2 hobs, 2 plates, some cutlery and a pan. This was very basic but you wouldn't want to cook a huge meal anyway!! It says in the room that this gets cleaned every 2 days and it does but the pillow cases were never changed, and the sheets were only changed once while we stayed there and as you can imagine with the sand and makeup wasn't very nice. Also we never got any more toilet roll from the first day we arrived we had to kept borrowing some from the beach toliets. The location of the hotel was amazing. It wasn't in the middle of all the clubs and bars because lets face it we all need a couple of hours sleep! It was at the bottom end a stones throw away from the beach which was the perfect location. I didn't see very much of the staff and who we did see they seemed polite always said Hi. The Kastro bar itself was very quiet and never really got busy, the bar next door, Charlies bar was a little busier, it had a tele and played english programmes. I would visit this hotel again as it was close to everything not to noisy and it was clean enough for a weeks stay. It is a 20's hotel though but they are harmless. We stayed in Primavera aprt we were a bit worried causes its a 2wenties holiday but we were surprised. We had a fantastic holiday, the staff were great, real holiday family very welcoming and Maria is just the nicest person u could ever meet any problems are met with a "no problem" then sorted out no fuss. the pool is a bit small but it did the job. nice bar with it and food served to ur sunbed!! The beach is seconds away and the nightlife right on the doorstep perfect location for lazy dayz and late nights!! Im hoping to go back in Sept!!! the hotel staff was very helpfull, food was very expensive. unless u are rich then you will run out of money. five min walk from the beach. but beach was discusting and also charged for sunbeds. there was hundreds of beds all over the beach they were trying to sell you so you got naged. the nicest thing about the hotel was the staff. room was clean but VERY basic.NO i would not go again. omg we stayed at the kastro and its right on the beach front literally an arms throw away.. The cleaners were so good we stayed there for 2 weeks and they cleaned our room everyday giving us new bedsheets and mopping the floor (we got special treatment as we were nice to them). The people at the bar were ace free shots on the 1st night. The hotel wasn't basic it was posh it was home away from home. Stayed here for a week with my sister. We had a feeling it might be a bit of a nightmare because it was a 2wentys holiday, but it was brilliant. The apartment was very clean and secure, the staff were all really friendly and the location is perfect! Two minutes to the beach and just at the start of all the nightlife. We got free shots every night from the bar, we loved it! I went to the kastro with a vision in my in my mind of it being awful because it was a twentys holiday. Well what a surprise I had I cannot complain about a single thing. The staff Nikos and Maria were amazing, hotel was in the best location and the reps were fantastic. I'm actually going back this year and cannot wait. I think I have definitely found my favourite holiday destination and would recommend malia fo anyone who is up for a laugh and a very good time.